In a move to counter fake reviews, ‘real’ Amazon customers must spend a total of fifty dollars (per account, in total) before being able to write a review. The greatest blow came last week when Amazon banned incentivized reviews, i.e. ones written in exchange for a free or discounted product. This move sent the entire review platform industry reeling. Apparently, Amazon is implementing the next step and wants to thoroughly clean out current product reviews that were left by product testers, i.e. incentivized reviews. This last move is surprising as the ban of incentivized reviews took effect October 3rd. Incentivized reviews left before that date should not be affected. 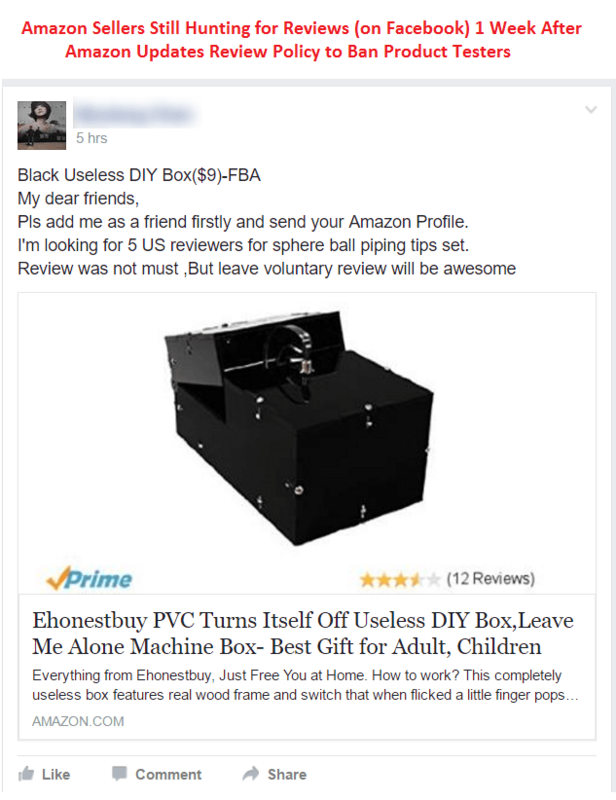 Nevertheless, more and more sellers are reporting that they were reported by Amazon per email that one of their reviews was deleted – or, they have simply noticed that some of their reviews have been deleted. According to news from Amazon, ‘excessive’ product test reviews are being deleted, or reviews that don’t comply with the earlier version of the review policy (a.k.a. Community Guidelines). 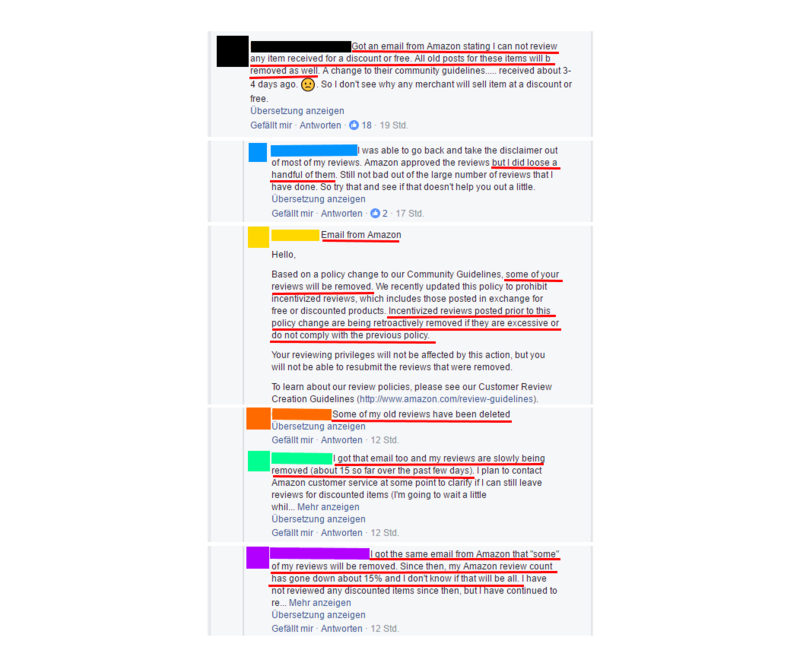 There’s a heated debate taking place right now, especially on Facebook. Amazon is notifying many reviewers by email (see the screenshot below) that their reviews have been deleted. What does this review policy crackdown mean for Amazon sellers? In spite of the clear ban on review clubs, there will certainly still be a few sellers and even product testers who are playing with the idea of getting around the policy. They could, for example, want to generate reviews that do not contain the disclaimer (that is something along the lines of “I have received this product at discount in order to test it….”). Some have already been hinting at this in Amazon FBA Review clubs on Facebook (see the screenshot below), and others are simply giving away their product for free or a steep discount in order to be reviewed on social media platforms, blogs or other sites that aren’t Amazon. One should refrain from that tempting thought, however, because Amazon will be very thorough in checking reviews in the future and actively be on the lookout for violations of the review policy. If one is caught violating the Amazon review policy, then Amazon’s reaction will certainly be – in many cases – suspension of the seller’s account. Regarding future developments on Amazon and concerning Amazon policies: We recommend that sellers ensure all their activity concerning reviews conforms to Amazon’s policies. 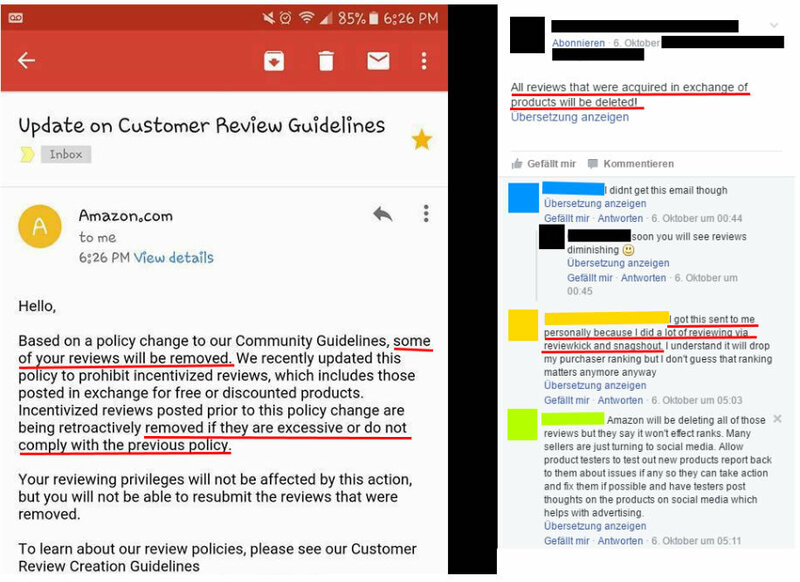 As we’ve seen here now with review clubs, even some practices that were tolerated by Amazon in the past can be retrospectively deleted / reversed if it negatively affects customers or customers’ trust in Amazon. What do you think about the latest wave of Amazon review policy crackdowns? We’re happy to hear your thoughts as a seller, (former) product tester, and as a customer. Leave a comment below or tweet @sellics_amz directly!